For Father’s Day, I received three gifts from my children, in addition to their very being, of course, which is truly the gift that keeps on giving the whole year through. Oftentimes even in the middle of the night. 1. MY VERY OWN PILLOW PET!!! Snuggly Puppy in the house, y’all! 2. A delicious strawberry Father’s Day cake lovingly decorated with pink frosting, a 2-inch layer of sprinkles, and just under 150 candles that spelled out “DAD.” When lit, it was visible from the International Space Station. 3. 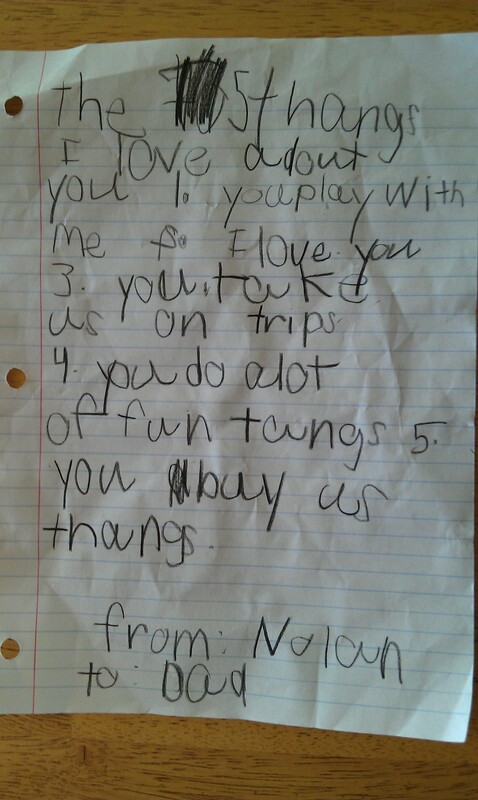 This letter written by my 7-year-old son, Nolan. Words are a special gift, especially from loved ones. And they don’t set off fire alarms. The letter was the best thang of all. Posted on June 21, 2011, in For Dads and tagged Chase McFadden, Father's Day, funny, funny writing, Humor, International Space Station, Ironic Mom, kid writing, Kids, Leanne Shirtliffe, Pillow Pets, Snuggly Puppy, Some Species Eat Their Young, Stuffkidswrite.com. Bookmark the permalink. 20 Comments. Oh lordy. I want to eat that piece of paper and absorb it into my being so I can always enjoy it. OK that letter really is a priceless thang. and i have to admit i had to google pillow pets. and i have now officially put the Wiggly Pig at the top of my birthday list. You get Wiggly Pig and your life will change. That’s a great letter, Chase. As gifts go, it’s tough to beat. Awesome. That’s a heart melter man, especially in years to come. And he even put buying thangs (Star Wars thangs, specifically) as number 5 instead of number 1, so that was nice. Very sweet letter. And dang, it came with a pillow pet. Can’t beat that with a stick. I reread it several times while resting on Snuggly Puppy before falling asleep for a blissful midafternoon nap. It was nice. I’m just wondering what number of thangs he was originally going to write…but then crossed it out for 5. Was that a 50?!? Because hooray for aiming big but adjusting expectations. And strawberry cake isn’t bad, either. At first I thought it said, “1. You play with me so I love you.” Then I realized the second part was #2. You do have that “boom boom pow” thang. Wait, that didn’t make the list. But it’s true. Nolan was just saying it in a fancier, gushier way. Plus, he wants you to know he likes it when you keep it active, dad. Trips, playing, buying. 😉 There are a lot of thangs to love about you, Chase. Think I might add “Has that boom boom pow thang” to the byline of my emails. Thanks, Renee.